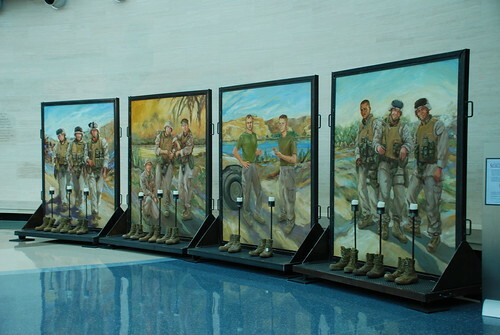 The museum has been hosting the Lima Company Memorial since September 11th. It will be at the museum until January 2010. The Lima Company Memorial honors the 23 men (22 Marines and the Navy Corpsman) of Lima Company, 3rd Battalion, 25th Regiment, a Marine Corps Reserve Unit based in Ohio, who were killed while deployed to Iraq in 2005. 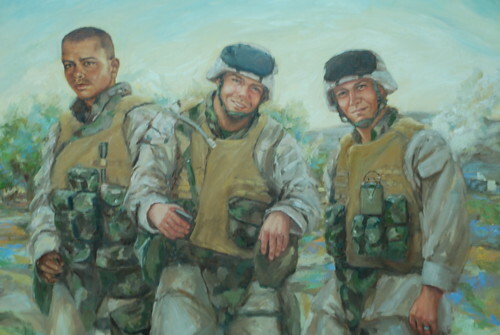 According the the Lima Memorial website, "The Ohio-based Marine Reserve unit, once known as "Lucky Lima," was one of the hardest hit single units in Operation Iraqi Freedom, suffering deaths of 22 Marines and their Navy Corpsman. 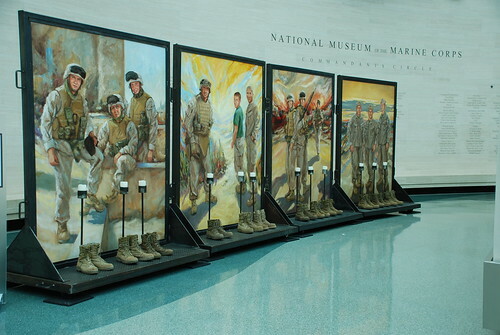 Created by Columbus artist Anita Miller, the memorial contains life-sized paintings of each of the 23 fallen heroes. 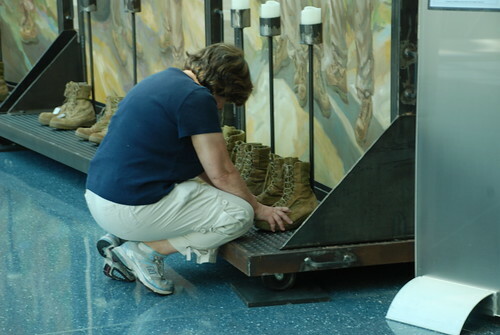 Names and statistics of each of the fallen men, an ever-living candle, boots and space for visitors to leave mementos are part of this moving memorial." The Artist, Anita Miller, envisioned life size portraits displayed in an octagon. You can see her conceptual drawing and read the story behind the memorial here. When it was completed, it was displayed in the rotunda of the Ohio Capital building, for a picture of how it was displayed, click here. It is currently on display in the Leatherneck Gallery of the museum. It is displayed in groupings of 4 panels on either side of the Tarawa exhibit. Today, I had the fortune of meeting some of the mothers of the Lima Company Marines. They were in DC for Remembrance weekend, in honor of Gold Star Mothers' Day. For those who don't know, a Gold Star family is a family who has lost a military son or daughter in a conflict. One of the mother's, Pat Murray, gave me permission to photograph her with the image of her son David Kreuter. I asked her which image was her son, she said, "This good looking guy right here." 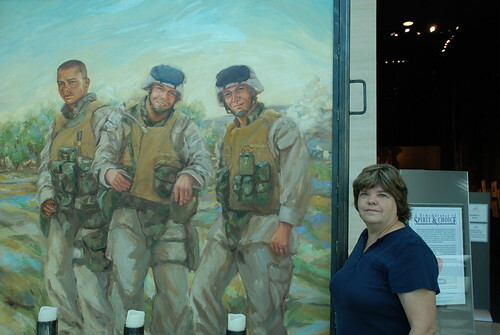 He is the the Marine pictured on the far right. She asked if I wanted her touching him when I took the picture. I told her "no" because we don't allow anyone to touch paintings and artwork. She told me no one had ever told them they couldn't touch the paintings. My sincere apologies, to everyone, if touching was the intent of the artist, I just didn't know. David is displayed on the last panel on the far right. His fresh smile, frozen in time. She said the artist invited the families to help varnish the paintings. That was very special she said. I asked if it was like touching him one last time. She said it was. When David was killed, he had been married for just a year. His son was only six weeks old. He did not wear his wedding band while in combat, this is not unusual. 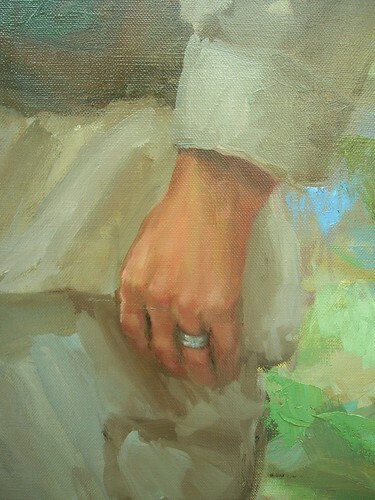 When the artist was painting the panel, his widow asked her if she could paint his wedding band in. The artist did. I am going to share with you one final photograph, I hope Ms. Murray is not offended by me sharing this moment with you. Saying her good-byes. Our freedoms are not free. The men and women in the military and their families know this. They have paid for it in separations, sweat, blood, tears and some, ultimately, their lives. I hope that those of you in the Washington DC area can take a visit to the museum to meet these young men.